An international campaign is underway to win national recognition for Willis Conover, the Voice Of America broadcaster who sent American jazz to millions of listeners around the world. A petition drive is aimed at persuading the United States Postal Service to issue a stamp honoring Conover (1920-1996). Efforts to win him a posthumous Presidential Medal Of Freedom have yet to yield results. Admirers established a Conover Facebook page in 2010, but recognition by the US government has been limited to tokens: his name twice being read into the Congressional Record. Through most of the cold war, Conover was the host of Music USA on the Voice of America. He was never a government employee, always working under a free lance contract to maintain his independence. 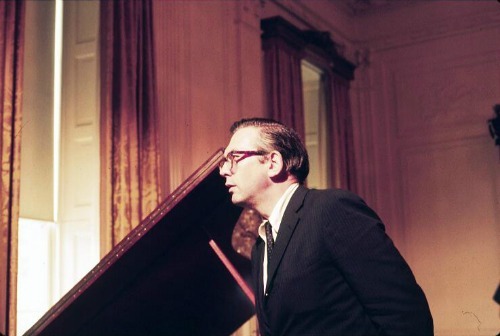 While our leaders and those of the Soviet bloc stared one another down across the nuclear abyss, in his stately bass-baritone voice Willis introduced listeners around the world to jazz and American popular music. With knowledge, taste, dignity and no trace of politics, he played for nations of captive peoples the music of freedom. He interviewed virtually every prominent jazz figure of the second half of the twentieth century. Countless Eastern European musicians give him credit for bringing them into jazz. Because the Voice is not allowed to broadcast to the United States, Conover was unknown to the citizens of his own country. For millions behind the iron curtain he was an emblem of America, democracy and liberty. The late Gene Lees made the case for recognition, to which I subscribe wholeheartedly. …Willis Conover did more to crumble the Berlin wall and bring about the collapse of the Soviet Empire than all the Cold War presidents put together. Will this postal stamp petition lead to Conover’s getting a long overdue posthumous Presidential Medal of Freedom? Perhaps it will if infuential senators and congressmen get behind the idea and persuade the White House. At the very least, the Postal Service honor could be an effective first step. The organizers’ goal is a thousand names. Let’s deluge them with signatures in multiples of a thousand. To learn more and to sign the petition, go here. One of the great contributions of Conover’s career was the part he played in organizing the White House tribute to Duke Ellington on Ellington’s 70th birthday in 1969. Willis put together the ten-piece band that serenaded Ellington with his own music, plus guest musicians Earl Hines, Dizzy Gillespie, Willie The Lion Smith, Dave Brubeck, Billy Taylor, Joe Williams and Mary Mayo. Drummer Louis Bellson arranged his former boss’s music for the occasion. The piece is “In A Mellotone.” The soloists, in order, are Paul Desmond, Bill Berry, Urbie Green, Jim Hall, Gerry Mulligan, Clark Terry and Hank Jones. After years of negotiations, Blue Note Records finally released a CD of the Ellington White House tribute concert in 2002. For a Dave Frishberg sidebar on Conover’s cold shoulder from the VOA itself, see this 2006 Rifftides post. Thank you, Doug, thank you!!!! Ms. Bush is a native of Zagreb, Croatia. She was a broadcaster on the VOA’s Croatian service and, most recently, on its Bosnian service. A Willis Conover stamp — yes, for sure. But it will be an uphill battle to get one.. Note that a Duke Ellington stamp of 20 years ago went almost immediately out of print (yet, rock stars are now honored philatelically), and a long available Eid (Ramadan) stamp has disappeared from the USPS catalog because, I fear, of some USPS bureaucrat’s warped definition of political correctnessor, worse, a neocon official’s edict. (“Say It Isn’t So,” P.O.!). Not honoring Willis Conover serves to perpetuate ignorance of how American music on VOA in the Cold War years helped to soften the perception of Americans as boorish and artistically ignorant, He kept alive the faith of VOA’s undercover listeners abroad in the genius and generosity of the American spirit. A Kansas City friend who came here from Bucharest and became a distinguished research scientist told me he had learned much of his English from the Conover VOA broadcasts. Yes indeed! The New York Times estimated that Willis had, worldwide, a hundred million listeners every day, for his four decades on the air. I’m not eligible to sign the petition as I’m not an American – but if I were, I certainly would. I’ll never forget listening to Willis Conover’s VOA broadcasts on shortwave in the 1950s. We had no regular jazz local broadcasts and he filled the bill admirably. One of the jazz artists he introduced me to was Herman Chittison – a musician very little heard of today. International signatures are welcome! You may have to select your country when signing so that it gives you the right options in place of state, zip code and such. Ms. Feustle launched the Conover petition and signature drive. And 1000 thanks to Doug Ramsey for this posting! Having written, in the late 1980s, about that unique character known as Willis Conover for the old English-language edition of Warsaw’s Jazz Forum magazinein the process spending an unforgettable afternoon with him in the VOA studiosof course I signed the petition the nanosecond I heard about it. It’s more disappointing that the Clintonians would have ignored Conover’s legacy than that the second Bush bunch would snub him. They were too busy squandering anything that was left of the enormous reservoir of good will toward the USA which Conover had a major – and apolitical – hand in creating. Willis Conover’s role in jazz radio broadcasting is on the level of Edward R. Murrow’s role in radio news broadcasting. We are lucky to have had the benefit of the efforts of the both of them. It’s about time! Recognition of the importance of Willis Conover is long overdue. Thanks, Doug, for calling this campaign to our attention. AYE! I live in Scotland, and, through the fifties into the sixties I tuned in nightly, on shortwave radio, to Willis Conover. He was the gem of the airwaves! I couldn’t thank him enough for his excellent Jazz Hour (Duke’s “‘A’ Train”) and Swing Hour (Neil Hefti’s “Coral Reef”). Even during my Army service, myself and two other jazz nuts commandeered the radio nightly. I recall that it was on the Jazz Hour that I first heard the Ellington At Newport ’56 concert recording. Luckily, I did see Willis Conover once when he toured as MC with the Newport Jazz Festival All Stars, which featured the Dave Brubeck Quartet, Dizzy Gillespie Quintet, and the Buck Clayton All Stars with Jimmy Rushing. This man should have been awarded a medal for his services 60 years ago! Hearty thanks for this post, and for your long ongoing efforts to honor Willis. I grew up in West Virginia, and thanks to my grandfather’s shortwave radio, his VOA broadcasts were a jazz lifeline for me as well. Is there, perhaps, some mechanism for petitioning for a Medal of Honor? Let’s hope that someone in the Rifftides readership knows how to nominate for a Presidential Medal of Freedom. That’s the award he should get. The Medal of Honor is a military decoration. Writing the President and your congressmen and senators might at least get the idea on the official radar. Medal, the higher being the Presidential Medal of Freedom with distinction. After you have seen that nostalgic clip on YouTube, explore the sidebar Conover videos. Don’t miss the three Willis Conovers on To Tell The Truth. I seem to remember reading somewhere at the height of those VOA broadcasts – probably in DownBeat – that Mr. Conover was almost unknown to American jazz aficionados. It’s heartening that we who live outside the US, who were acquainted with him and were receiving his programs, are being permitted to sign the petition. Many thanks to you and to Maristella. Thanks for passing this along. I knew about Willis Conover but never heard him on the radio. However, Ed Beach’s show was available to me long ago and his intense devotion to the music helped stimulate my early interest in jazz. Obviously, Conover had a similar effect on a great number of people. These shows were lectures from great educators. I heartily endorse a stamp with Willis Conover on it. And if we get this, it should be the beginning of further recognition of his many accomplishments. I am heartened to see so much support for the petition. The campaign has really taken off since yesterday! As I write, the number of signatures has reached 1006. It augurs well for the future. I knew Willis, and often let him know how much I admired him and his work. He was a fine man, highly deserving of his nation’s gratitude. I hope this groundswell of appreciation will have some effect, but I am not optimistic. I’d certainly sign up if I were a citizen of the USA (I’m a Brit). And how about the fantastic Clark Terry (bless him) whose legacy in music is astounding, both as a mighty outstanding musician and as a brilliant educator — he was also a very lovely, funny and generous gentleman. There are some amazing others of jazz we all could name for celebrating in such a manner. I wanna keep posted — boom-tish!! International signatures are okay. See Maristella Feustle’s first comment above. For international signatures, selecting your country first before starting to fill out the form will override the default, U.S.-specific settings. That should fix it (famous last words!). When Terence Ripmaster was writing his book on Willis Conover, I recommended that he arrange for a CD-appendix with Willis’ voice based on recordings from the VoA archives to go with the book. A few years ago, I advocated the release of a CD with Conover’s jazz programs. The two VoA staff members I was in contact with thought it a brilliant idea, but that, too, came to nothing. It is therefore my sincere hope that the issuing of a stamp in his honor won’t be a flop also.